In a recent "60 Minutes" interview, Rep. Alexandria Ocasio-Cortez (D-N.Y.) proposed raising the federal tax rate on incomes above $10 million up to 70 percent. The move would affect less than one-tenth of 1 percent of U.S. households and return the top marginal tax rate to its 1980 level. 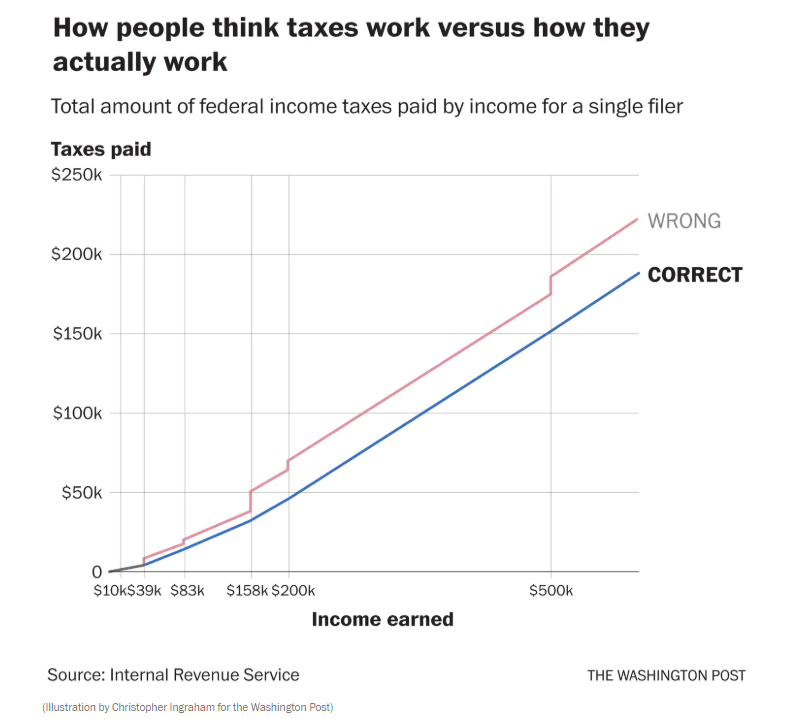 Merits of the proposal aside, the resulting debate in Washington has underscored the fact that many Americans do not understand how federal income tax brackets work. Several policymakers and low-tax advocates suggested, incorrectly, that a top rate of 70 percent would affect all income earned by certain earners. These distortions are rooted in the common belief that a single federal income tax rate applies to a person's entire annual income. Under this misbelief, that tax rate is determined by how much a person makes in a year. This is often reflected in how people talk about their taxes, saying things like "I'm in the 24 percent tax bracket" or "I'm in the 12 percent tax bracket." If income taxes were really calculated like this, there would be drastic jumps in the amount of taxes people pay when their income surpasses certain thresholds. Under this line of thinking, an individual making $38,700 in a year — the very top of the 12 percent tax bracket for tax year 2018 — would pay a total of $4,644 in taxes (12 percent of $38,700). If their income rose to $38,701, that would bump them up to the 22 percent tax bracket and nearly double their total tax liability to $8,514.22, which is 22 percent of $38,701. 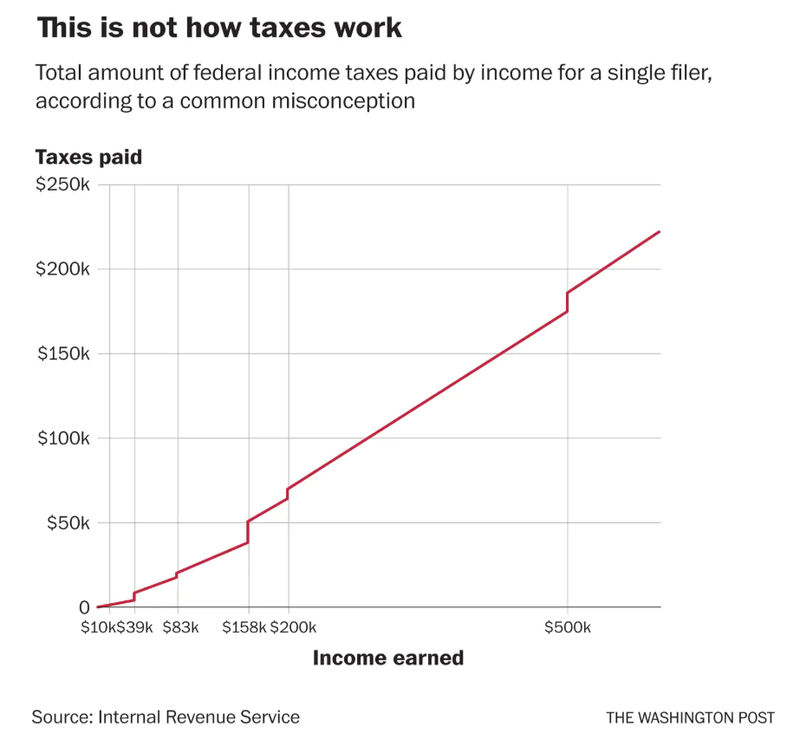 Apply this logic across all seven tax brackets, and the relationship between income earned and taxes paid is marked by sudden jumps, as in the chart below. A 2013 YouGov poll found that roughly half of Americans believe taxes work this way, with Republicans being significantly more likely to believe this misperception than Democrats. 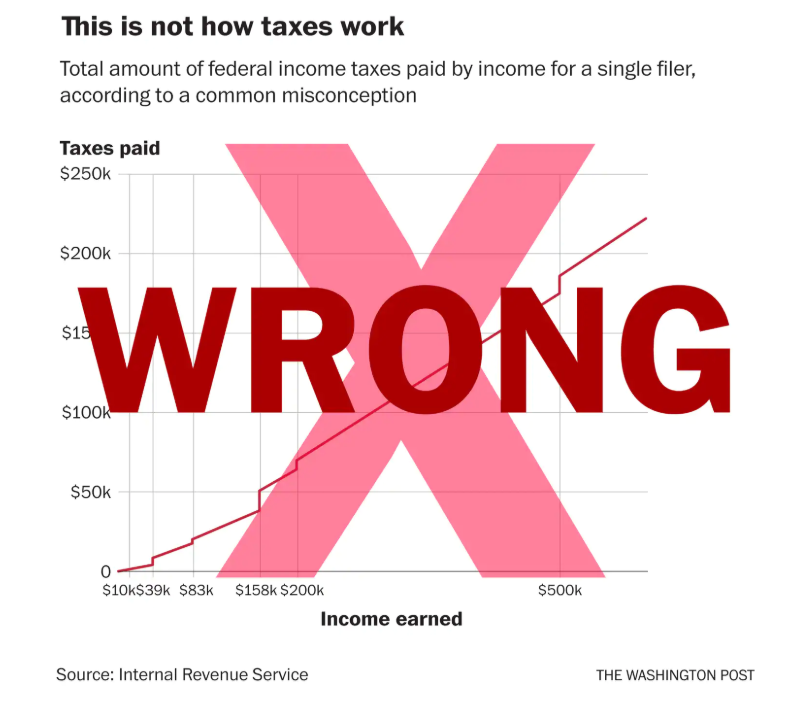 People who believe taxes work like this sometimes try to keep their total income below a certain bracket threshold because of the mistaken belief that going slightly over that threshold will result in a significantly higher tax bill. Let me reiterate: This is wrong. Here's how it actually works. You pay a 10 percent rate on the first $9,525 you earn. Then a 12 percent rate on the income above that, up to $38,700. Then a 22 percent rate on the income above that, up to $82,500. And so on. To return to the example above, an individual making $38,700 a year pays a total of $4,453.50 in taxes. That works out to 10 percent of the first $9,525 they earned ($952.50), plus 12 percent on their earnings between $9,526 and $38,700 (which works out to $3,501). If they make $38,701, their tax bill edges up to just $4,453.72 — that's the $4,453.50 plus an additional 22 cents for the dollar over $38,700, which is taxed at the 22 percent rate. When you chart that relationship out similarly to what we did above, you get a nice, smooth curve. There are no jumps between brackets. This is why it's not exactly correct to say things like "I'm in the 22 percent tax bracket." Think of it this way: Tax brackets apply to income, not to individuals. The same 10 percent rate applies to the first $9,525 earned whether the earner makes $50,000 in a year or $5,000,000. So in the coming weeks, if you hear a talking head suggest that a top tax rate of 70 percent means that the government will be taking away 70 percent of a person's earnings, it's a sign that the speaker either doesn't understand how taxes work or is deliberately trying to mislead you. 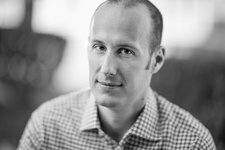 This article was written by Christopher Ingraham from The Washington Post and was legally licensed by AdvisorStream through the NewsCred publisher network.